Penunggun Karang, or also called Pelinggih Sedahan, is a security guard in the spirit that keeps the household from evil spirits disorders. Balinese Hindus believe that the Earth is not only inhabited by creatures invisible to the eye, but also by creatures that are not visible, or spirit. Spirit there are good and some are evil. Therefore, to preserve human life from evil spirits, founded a Penunggun Karang in every yard. The spirits that haunts, such as the spirit of the old man's body was not cremated, or unnatural death, such as buried large buttresses (which never happened in Bali in the 18th century) will be looking for another place to live and scrambling. 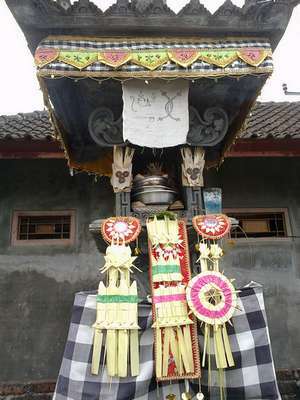 To protect themselves from interference haunting spirits, people built Penunggun Karang / Palinggih Sedahan. Function Penunggun Karang / Palinggih Sedahan not be underestimated, given the island of Bali is very different from any place. Balinese people who have yards, whatever it is, whether the fields, or place of business, to build a small temple, the grounds keeper of the interference of evil spirits. If that is not done, the most likely human harmony in the yard will be delayed. If you come to Bali and want to stay at a hotel in Bali, it helps you pray in Penunggun Karang invoke protection from evil spirits.